PDF available for SWET Members (must be logged in). 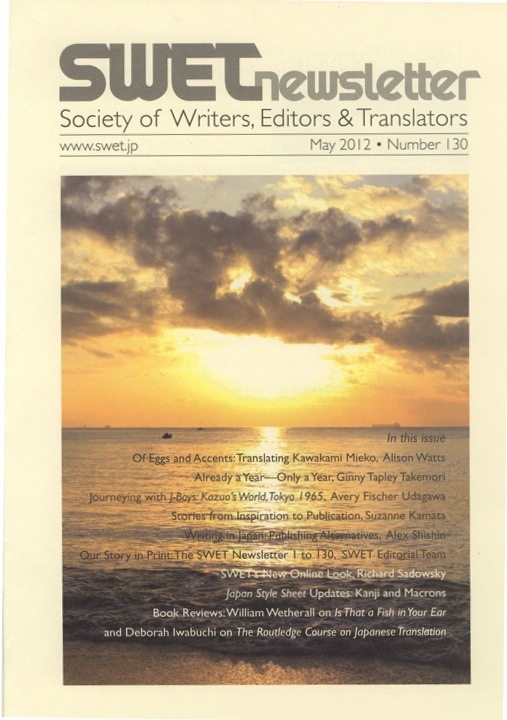 The delay in printing and delivery of SWET Newsletter, No. 127 was part of the testimony of the Great East Japan Earthquake and Tsunami. We thank members for waiting patiently for it to appear. The Komiyama Printing Company factory that does the actual printing of the SWET Newsletter is located in Motoyoshi-machi, Miyagi Prefecture, in the mountains along the line between Sendai and Kessenuma, the area devastated by the tsunami. On March 11, just as the PDF for printing No. 127 was sent to the factory, the powerful main quake occurred. Electricity was cut off and the employees of the factory scattered to check the safety of their families and homes. The safety of all the employees and their families was later confirmed and the factory suffered no damage, but 36 of the 200 employees lost their homes and are living in shelters. Transport to and from the area was severely restricted for three weeks, but as of April 4, all services were restored. We would like to express our sincere thanks for the good work of the employees of the Komiyama factory and our hope that their difficulties will soon be overcome.